It has been a roller coaster ride for Twitter (NYSE:TWTR) this year. Twitter stock started 2018 on fire and that continued as TWTR stock surged to nearly $50 per share. That was impressive, considering the shares were trading below $20 just a year ago. But those gains have unraveled, as social media stocks remain under pressure. Facebook (NASDAQ:FB) is still being punished as its shares trade near their 2018 lows, while Snap (NYSE:SNAP) is being demolished as SNAP stock trades below $8. With that in mind, here are three reasons why Twitter stock is attractive. It’s true that Facebook, Twitter, Alphabet (NASDAQ:GOOGL, NASDAQ:GOOG) and others may come under regulatory scrutiny, but they’re not going away. In fact, I believe that Twitter has a ton of value. It’s the go-to spot for breaking news and creates a real-time platform for discussions about hot topics. If someone wants to release breaking news, they do it on TWTR. When something important is happening, people head to Twitter to talk about it. The platform’s popularity in these areas adds value to TWTR stock. TWTR is cleaning up the bots and trolls on its platform, in an attempt to make it more enjoyable. Will those efforts make Twitter a takeover target again? Last year, a handful of companies, including Disney (NYSE:DIS) and Salesforce (NYSE:CRM), were considering buying TWTR. Will buyers come back now that Twitter’s growth is accelerating and its user experience is improving? It’s possible. The fundamentals of Twitter stock are finally improving. In the second quarter, the company’s earnings and revenue beat expectations, but TWTR stock dove after the company reported that its monthly active users had declined versus the previous quarter. Analysts were looking for a gain of 1 million users. Instead, Twitter lost 1 million users compared with the first quarter as it continued to delete abusive and misleading accounts. At least Twitter’s revenue is growing, though. Not long ago, TWTR was slogging through stagnant user growth, annual declines in revenue, and was unprofitable. Now, though, analysts expect its revenue to rise 19% this year and more than 13% in 2019. On the earnings front, analysts’ consensus estimate calls for 60% growth to 77 cents per share in 2018 and another 13% increase in 2019. The platform is getting more engaging, and Twitter’s management has committed to cleaning up the abusive behavior, trolls and bots that have plagued it in the past. Those developments could attract potential M&A buyers and at the very least, should increase the platform’s engagement levels. So we already know that Twitter is a go-to platform for real-time news, while its fundamentals continue to improve. Those are good reasons to own Twitter stock. However, do the charts indicate that TWTR stock is a name we should buy? Above is a two-year daily chart of Twitter stock which highlights various trends over that time. Below is a nine-month daily chart that more closely examines the recent movements of TWTR stock. Let’s start with the long-term chart. After a big rally in October, Twitter stock began a sharp uptrend, which is depicted by the blue line. That eventually pushed shares through rising resistance levels (as shown by the black line) in 2017. However, after that uptrend broke down, Twitter stock has been in free-fall. 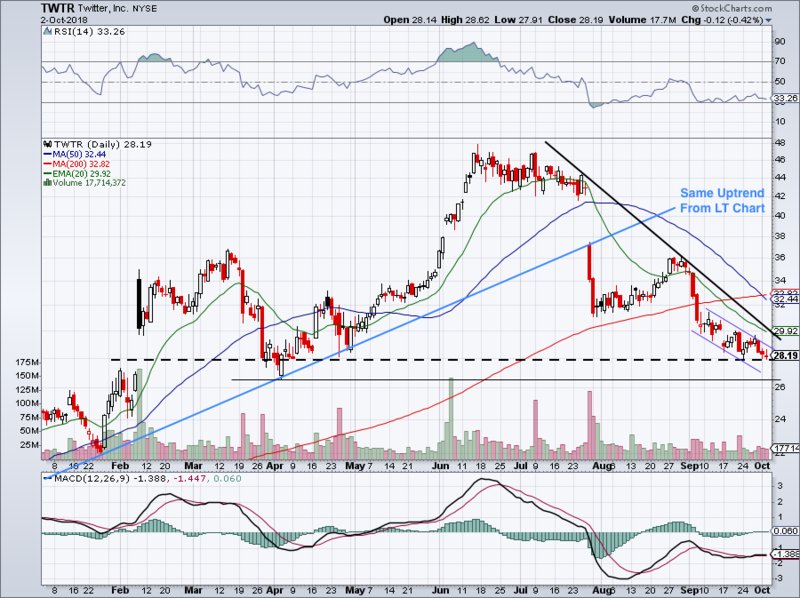 The $28 level continues to act as support in the short-term, but there are concerns as to whether Twitter stock will fall below it. There is a small descending channel. shown by the purple lines, weighing on TWTR stock and a larger, steeper downtrend, indicated by the black line, just above it. Coincidentally, the intersection of this downtrend line and the 20-day moving average is the breakout point for Twitter. 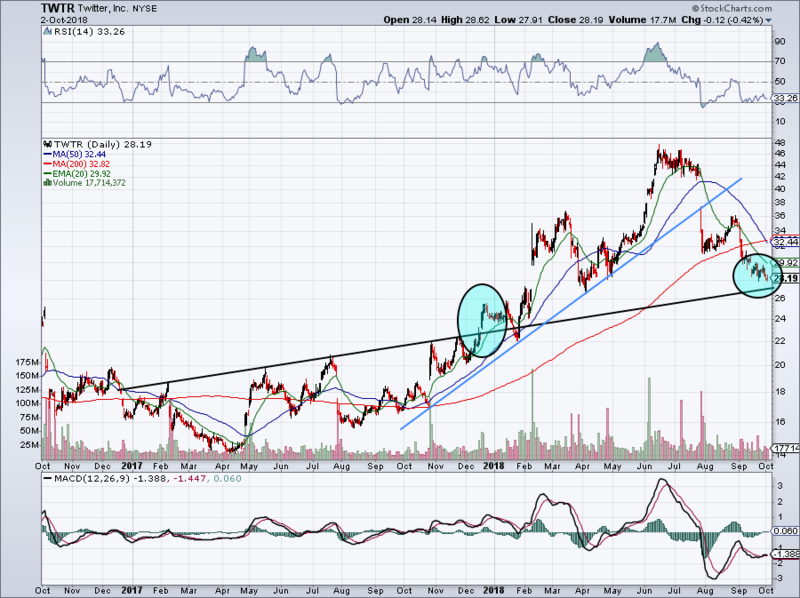 If Twitter stock can stay over and meaningfully rise above $28, then it could rally when it reaches the low-$30s. If $28 fails, look for a decline to the $26 -$26.50 area. That’s where trend support from the long-term chart and the April lows may come into play. Bret Kenwell is the manager and author of Future Blue Chips and is on Twitter @BretKenwell. As of this writing, Bret Kenwell is long GOOGL and CRM. Article printed from InvestorPlace Media, https://investorplace.com/2018/10/3-reasons-to-buy-twitter-stock/.